I'm back to painting the City. October is a beautiful time in San Francisco. After a long foggy summer, the sun is shining in San Francisco. 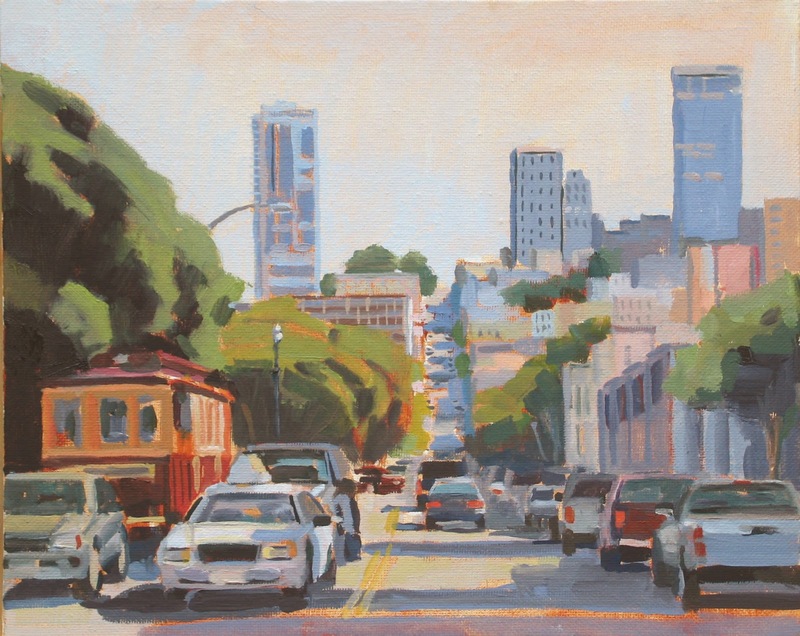 When painting scenes of San Francisco it can be a little tricky to capture the sun on the streets. It depends upon the height of the buildings and the time of the day. Usually artists prefer to paint in early morning or late afternoon light because the long shadows create drama in compositions. But in San Francisco, it can be better to paint and photograph at noon with the sun directly overhead. On some streets, midday is the only time the sunlight can break through the tall buildings. 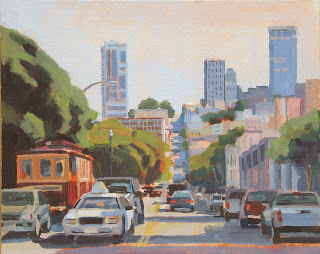 The cable car in the painting above is a replica of the old car on the O'Farrell and Jones Street line. I like the red color that the cable car brings to the composition. I also like the warmth in the street where the sun hits, I've added a little yellow to the cool gray to warm up the color on the street.